If you follow me on Instagram, you’ve definitely seen how much we’ve been using our grill and smoker since the weather warmed up. I always remember that people around here would jokingly say that, after a long winter, you’ll see people in shorts washing their cars when the temperature hits 45. Well, that’s pretty much how we were with our grill! Every weekend that we’re home, we’ve tried a new recipe for outdoor cooking. This past weekend, we tried to mix up our flavors by adding some various salts. I partnered with World Market to pick out a few products (which are all on sale for 20% off today only!) to experiment with some summer cooking with salts. 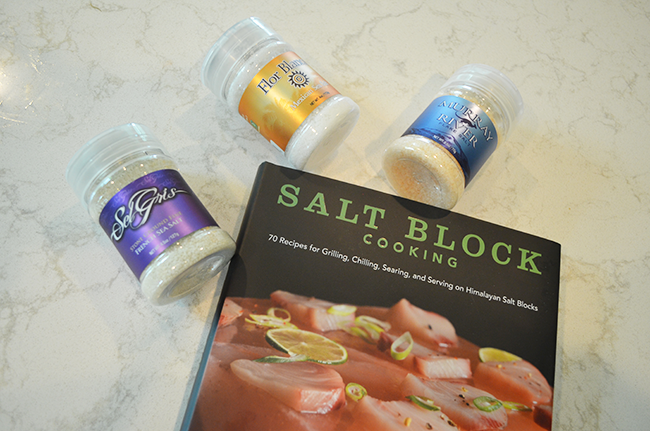 I’ve never cooked with a salt block before, so I picked up this one, along with the “Salt Block Cooking” cookbook. The first thing we tried was a watermelon, feta and mint appetizer. 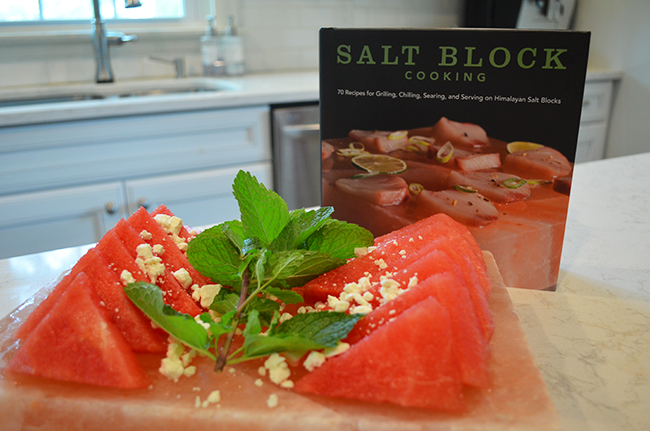 I was a little skeptical about this one, but I know a lot of people say that salt brings out the flavor of watermelon – and you really don’t get much more summery than fresh watermelon! Along with smelling amazing, this little dish tasted really good, with a really subtle salt flavor to it. This one would be really great for a party where you’ve got several dishes sitting out. It makes for a pretty display and gets better as you let it sit. 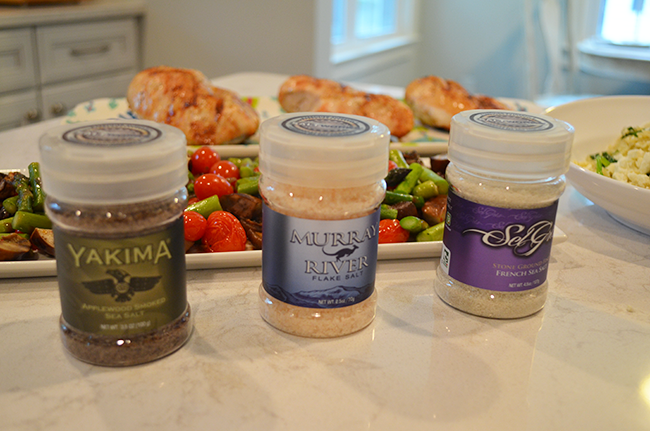 We also did a really simple dinner of grilled chicken and vegetables, simply seasoned with a few different salts from this great variety pack of salts from around the world. 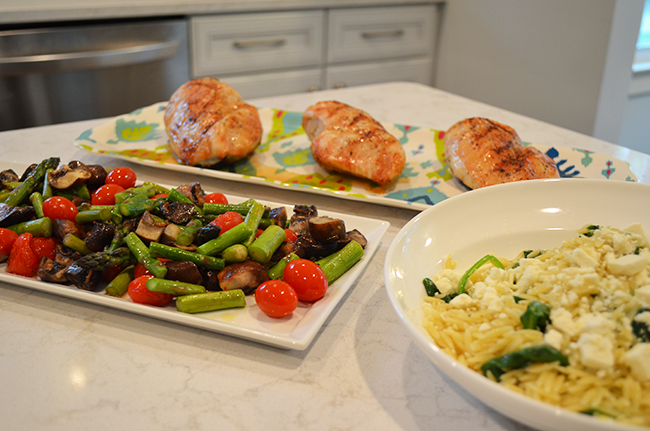 Before grilling, we seasoned our chicken with olive oil, lemon pepper and kosher salt, and I chose to finish it with Applewood Smoked Sea Salt, which added a nice richness to it, and enhanced the grilled flavor. My go-to veggie combo as of late is roasted asparagus, mushrooms and tomatoes. I season them with olive oil, lemon juice, salt and pepper, then roast at 400 degrees for about 15 minutes. To finish these before serving, I added some Murray River Flake Salt which is very light and I felt like it brought out the lemon flavor nicely. I’m really looking forward to trying some more of these salts on fish and even summer pastas. I’ve also actually seen a fruit salad with French Sea Salt that I’ll be preparing for our next summer picnic. Oh and this truffle sea salt would be perfect on popcorn! As I mentioned, all of the salt products in this post (plus more!) are on sale for 20% off today only at World Market. So it’s the perfect time to pick up something new to try with your summer cooking!